I can’t count how many times I have driven past Mustard Seed located at 7349 Wisconsin Ave and just assumed it was a restaurant. With over 250+ restaurants in Bethesda, I just never looked at it carefully enough to realize that it wasn’t about food at all – but clothing! And not just any clothing, but cool modern, contemporary brand-name clothes, shoes and accessories at very reasonable prices due to the fact that much of it is secondhand. Now being completely honest, I hate thrift stores. 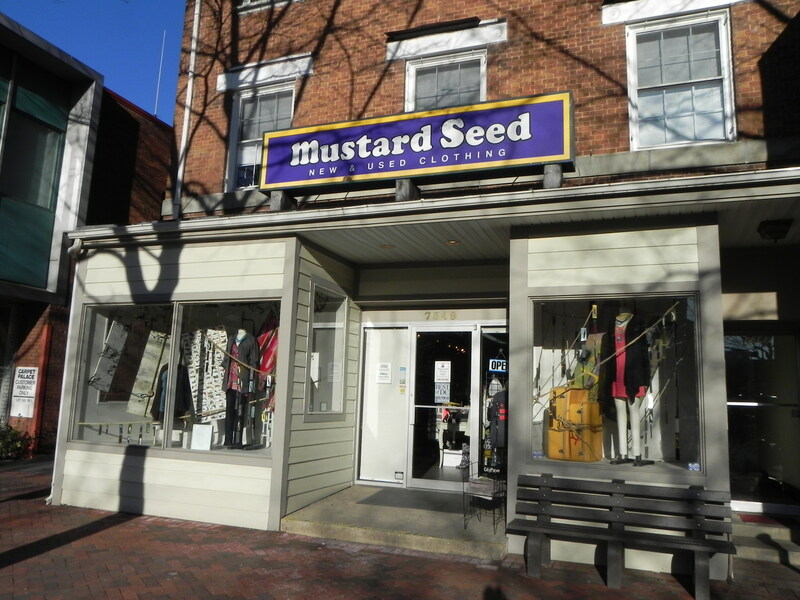 The first time I heard about Mustard Seed I was at a cocktail party and talking with some new acquaintances who mentioned some of the great designer labels that they had found there. (The realization came over me that it wasn’t a restaurant! Don’t I feel like the newbie in town.) They were gushing at the low prices they paid and how the store has some great things. Hmmm. These ladies didn’t seem like the types who had the patience or desire to rifle through the thrift store racks. My interest was piqued, I admit. But still…secondhand seemed potentially “seedy” to me (forgive the pun). So recently I ventured into the shop – not sure what to expect. I was very surprised first by the fact that the boutique-sized shop was tastefully organized with very nice clothing that appeared to be in great shape. This did not feel like a “thrift store” at all – at least not the kind that I had experienced in the past. I was also surprised to find that the store offers new clothes as well secondhand items. At the time I visited, the store was quite packed with well-dressed customers and the staff was busy but helpful when I inquired about the store’s history, its ownership and the procedures for selling items. In a nutshell, you must make an appointment to sell your items and can bring up to 25 pieces. Don’t waste your time with clothes from Target or Sears – they are looking for labels. If your things are new with tags still attached, they do look for receipts as well. All the details are available on their website along with the on-line system for setting up your appointment. Don’t expect to get full price or anything close to that for your stuff (hey, you would probably be donating it otherwise) but what is pretty terrific is that they pay you 50% of what they expect to sell it for right then and there. It is not a consignment shop where you wait and see if your items sell. If they accept it, you get paid right now. Here is a great review on Yelp by Maggie A. of Washington, D.C. who wrote about her experience as a first-time seller at Mustard Seed and what you can expect. This entry was posted on Thursday, March 3rd, 2011 at 5:08 pm and is filed under Shops & Businesses. You can follow any responses to this entry through the RSS 2.0 feed. You can leave a response, or trackback from your own site.